Airbus has confirmed its flagship A380 planes could be grounded for up to eight weeks if work to repair cracks in their wings is done in one go. "This is from start to finish," Airbus spokesman Justin Dubon told the BBC. However, he added that Airbus expected most customers to do the repairs step by step, as part of regular required maintenance checks. "In this case, it would only add a few days to the overall procedure," Mr Dubon said. Airbus has been dogged by the problem with its superjumbo A380s, which have seen hairline cracks appear on some of the brackets used to link the wing to the plane. Each A380 has 4,000 such brackets. The problem has cost Airbus more than 250m euros (£201.9m) in repair and service costs. Airbus has said it will not pay any compensation for revenue lost during repair work. 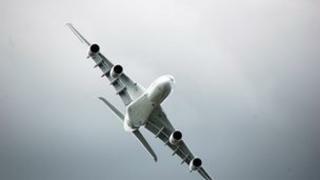 The problem poses no safety threat, according to Airbus. "The important thing is that these aircraft are safe to fly," added Mr Dubon. The plane manufacturer, a subsidiary of aerospace giant EADS, will begin building A380 wings with a new type of aluminium from next year, meaning aircraft delivered from 2014 onwards will not have the defect.